What Is In That Cloud? My hair is pretty important to me. Not that it’s some wonderful thing, but perhaps because I always struggled with making it tame when I was younger. When it came “in style” to wear it straight, I knew I was in for some serious challenges. My hair is fine, dry, and curly… and there is LOTS of it – so it’s THICK. My brother’s used to call me Medusa on any given morning, at the breakfast table. Yes. It can get ca-razy. I was blessed after college, with a great hair dresser in the city. It was 2 hours to visit her, but before kids – this was my every-other-month shopping trip and girl time. I loved how my hair felt and how my stylist understood my needs… and my hair. Then came the children… and going to the city, was… no longer a practical option. Thankfully I was blessed again with a wonderfully talented friend, named Melissa. Melissa understood my hair too, and again my hair was happy. I got the right products, the right cut, 12 years later – I’m still very happy! When I realized my favorite hair products probably worked so well, because they had WHEAT PROTEIN in them. Unfortunately – they were making me ill and not helping my cause. I was very, very sad. Many people said that because you’re not ingesting hair products, it shouldn’t be a problem… But I read enough other information which made a good case that explained how *I* had been feeling. I wondered why I always got bad headaches while getting ready to go somewhere, and rashes from different deodorants and soaps I tried. Yes, the gluten-filled products had to leave. 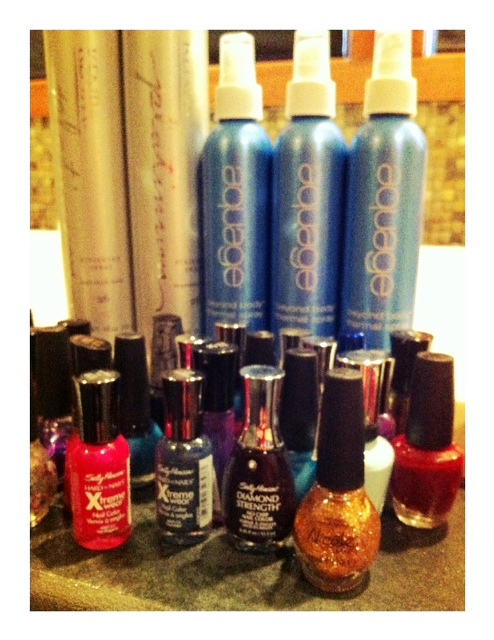 My GIANT bottle of Kenra… which I dearly love – was recently kicked to the curb… along with a lot of other products. “Now WHAT?” I thought. This is insane! What CAN I use that will work and not make me sick? It didn’t help that this week’s weather has my hair on HIGH FRIZZ alert. Suddenly my hair felt dry, out of control and just YUCKY. We began looking at all of our cosmetics… the body wash, shampoos, our nail polishes and deodorants… and slowly weeding everything out that could potentially irritate rashes, or be ingested. A little sad – but knowing, “Ok, this isn’t making me sick”, is very comforting. We’re still on the search for the perfect products to tame this beast, but we’ll get there! Today is better than yesterday, and that’s all I can ask for. We really DO need to be checking out all of these products these major companies are selling us. It’s CRAZY what is in some of them… and obviously we’re abosorbing it into our systems. I ordered some Zoya nail polish, which is gluten-free and comes dermatologist recommended… and I’m excited to try that! Toxins – BE GONE! Posted on May 4, 2012, in Celiac/Gluten Sensitivity, Change, Label Reading, Our Struggles and tagged celiac disease, celiacs, gluten free, gluten in hair spray, gluten in nail polish, gluten rash, healthy eating, healthy for God, reasons to be healthy, wheat protein in nail polish. Bookmark the permalink. 2 Comments. Hi! I came across your blog while searching for answers to my six year old’s rash on both elbows. I’m almost certain it is celiac. I’m now trying to gather as much information as I can before I take him to the doctor and it gets dismissed as psoriasis. All three of my children occasionally get teeny tiny red spots all over their torsos. It’s usually only visible under bright fluorescent lights. I now wonder if that’s been a symptom of celiace disease. Any way… I am also a hair dresser and wanted to inform you about Pravana’s new Nevo line. All natural, gluten free. It’s amazing. You should definitely look into it! Thanks for the heads up. I’m glad you found the info I shared to be helpful to your family. God bless!